Most 3D printers – even the low-end ones – still cost thousands of dollars. What the rest of the world has still to master (i.e., making these futuristic machines affordable enough for everyone), one West African inventor did on his own for a mere $100. 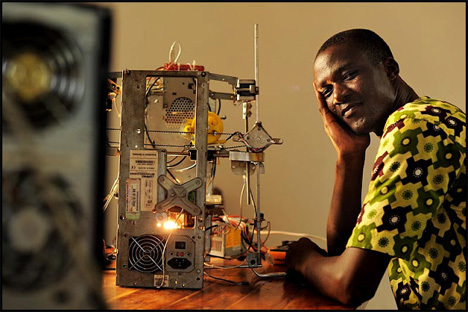 Kodjo Afate Gnikou, who lives in Togo, scrabbled together the needed parts mostly from e-waste. E-waste is a global problem that is only getting worse as people around the world discard their “old” gadgets for the brand new shiny ones – and as poorly-made or low life expectancy machines stop working. To keep these potentially harmful materials out of landfills while empowering Africans with the latest technology, Gnikou dug through a junkyard and found discarded but usable tech materials. 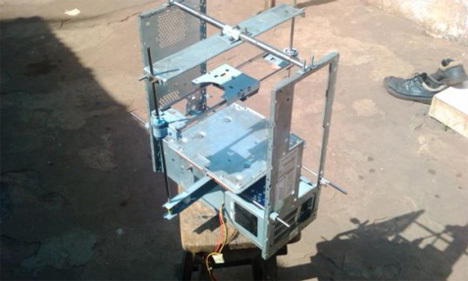 The W.Afate project is supported by WoeLab, a group of hardware hackers in the city of Lomé. The project is also a part of FacLab-France, a group that wants to make essential machines from recycled e-waste in preparation for missions to Mars. 3D printers can be a vital part of future space missions, so the W.Afate project could end up taking e-waste to the red planet, but in the most benevolent way possible. See more in Do It Yourself or under Technology. October, 2013.